Last week at the IBM Lotusphere 2011 conference Elguji Software partner ISW won the prestigious Lotus Award in the "Maximizing Value with an Open Source Solution" category for their WildFire sidebar plugin app. WildFire was also featured as the OpenNTF Featured Project of the Month in April, 2010. Please join Elguji in congratulating Adam Brown, Mat Newmann and university intern Andrew Welch on winning this award. Large enterprises are quickly learning to be more "social." Just about every organization has a Facebook page and a Twitter account (if not multiples of each). Now many of them are looking to take their social media initiatives to that proverbial, "next level." Elguji Software has just published a brief paper entitled, "The Social Software Platform Your Already Own." In it, Elguji President and CEO Bruce Elgort outlines how a company's existing IBM Lotus Notes and Domino groupware collaboration platform can be easily transformed into a social media ecosystem that tightly integrate your customer's ideas with your company's infrastructure. 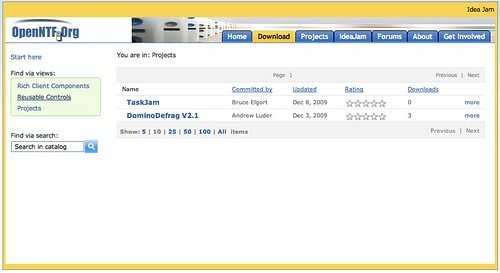 "The Social Software Platform You Already Own" paper can be downloaded at no charge here. This Award will be presented to person that provides the best template, solution, widget or sample, made available via Open Source through OpenNTF.org. The offering must leverage new technology innovations introduced into the IBM Lotus® Notes and / or IBM Lotus Domino 8.X, such as XPages, Live Text, Application integration with the Sidebar, or mobilization of applications. Submissions for this Award should be solutions that leverage these new technologies to address a specific business need. Entries will be judged based on wow factor and completeness of solution (30%), innovation (10%), overall business value they demonstrate (30%), the extent to which these solutions leverage the technologies, and the ability to demonstrate how these enhancements boost end user and organizational effectiveness (30%). Special consideration will be given to developers new to the Notes and Domino development environment. This Award will be presented to the business partner that provides the best commercial application made available via Open Source through OpenNTF.org. The offering must leverage new technology innovations introduced into the IBM Lotus® Notes and / or IBM Lotus Domino 8.X, such as XPages, Live Text, Application integration with the Sidebar, or mobilization of applications. Submissions for this Award should be solutions that leverage these new technologies to address a specific business need. Entries will be judged based on wow factor and completeness of solution (30%), innovation (10%), overall business value they demonstrate (30%), the extent to which these solutions leverage the technologies, and the ability to demonstrate how these enhancements boost end user and organizational effectiveness (30%). Special consideration will be given to developers new to the Notes and Domino development environment. Best of luck to all the individuals and business partners submitting award entries. For the record Elguji will not be submitting any award nominations for either of these two categories.